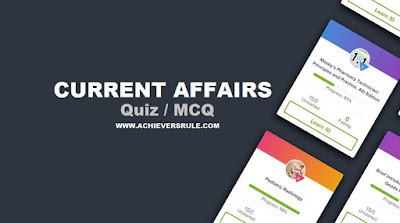 The Daily Current Affairs Quiz for 7th May 2018 has a list of 15 questions which are based on the Latest Current Affairs Updates and Static GK and Note Down Points. Each of the questions have been provided with answers and proper explanation. These are important for the upcoming exams of Bank, Rail and SSC. Aspirants should go through all these for a better preparation for the examination. This will help aspirants know more about the subject and improve their performance with each examinations. Q1. Which state constitutes 5th State Finance Commission seeking to uplift Panchyati Raj System ? Q2. What is India's growth rate according to Asian Development Bank? Q3. Which country is going to be the world's fifth biggest economy? Q4. Which is the most trusted brand according to the Brand Trust Report of 2018 ? Baba Ramdev's flagship company, Patanjali, beat around 1,000 of India's top FMCG companies to emerge as the most trusted brand in the sector, as per TRA's Brand Trust Report 2018. Q6. Vice President M Venkaiah Naidu is going to visit which of these countries? Q7. Which state is going to develop world-class ecosystems for Skill based programmes? Gujarat Chief Minister Vijay Rupani said that state government will take all possible steps in developing world-class ecosystems for Skill based programmes. Q8. Which state government high court instructed to appoint 22 judicial magistrates for setting up judicial committee? The Jammu and Kashmir High Court directed the state government to appoint additional 22 judicial magistrates required for setting up of juvenile justice boards in all districts. The Border Roads Organisation (BRO), a leader in infrastructure development in the border areas of the country, will celebrate its 58th Raising Day. Q10. From which year Pravasi Bharatiya Divas is going to become biennial event? Q11. which state government has started a census to count the Indus dolphins? To check the aquatic life present in Beas river, the Punjab government has started a census to count the Indus dolphins-one of the world’s rarest mammals..
Q12. Which Nobel prize have been cancelled for the year 2018? Nobel prize in literature 2018 cancelled after sexual assault scandal. Q13. which countries Royal Navy receives its first autonomous minesweeping system? Q14. From which country has the Communications satellite been launched to connect Asia-Pacific? Q15. The 'Go to Village' mission has been launched in which state? Manipur Chief Minister N. Biren Singh launched 'Go to Village' mission throughout the state from Konuma ground here.